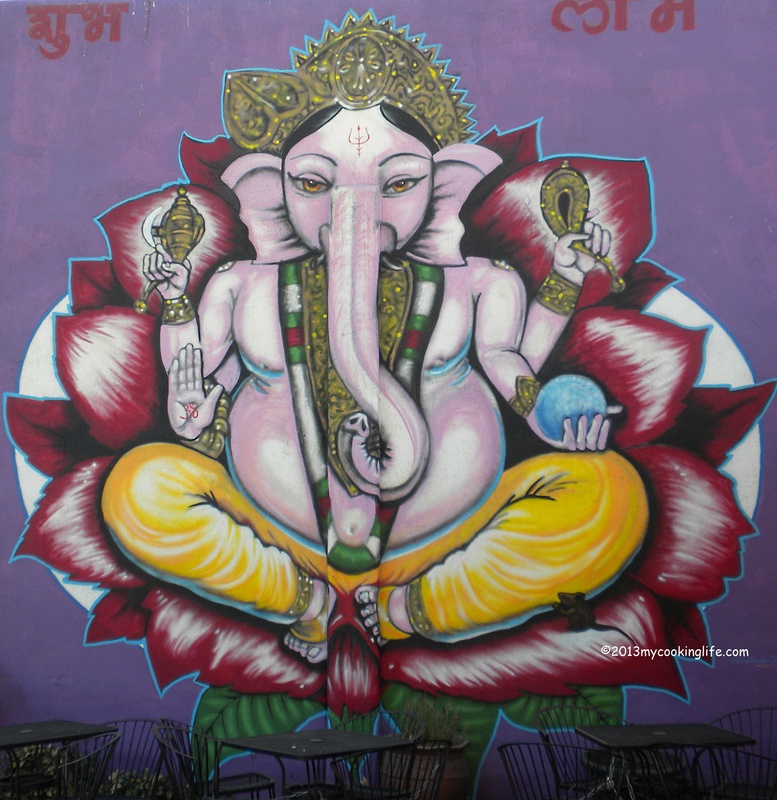 Mural at a local ayurvedic cafe. Other than my once-a-month quest for dark chocolate mousse, I do not use sugar in my cooking. Lately, this has caused quite a dilemma for me because I’ve had a tremendous hankering for chai! Chai is tea made with milk, spices and yes–sugar. But I don’t drink milk and I avoid sugar. I tried ordering chai at the local coffee shop a couple times, made with soy milk, but the chai part is pre-mixed and you cannot get it without the sugar. And it is, in my opinion, way too sweet. I knew I wouldn’t continue ordering it and I also knew I probably wouldn’t make it myself at home. Sigh. There are lots of things I do take the trouble to make myself even if it seems time-consuming. Nothing but the best for me and my family! Most of the time when I write about food and cooking here, I am talking about making things yourself, with high-quality ingredients you yourself have chosen and not falling for poor substitutes of pre-made, pre-packaged food. Even from the natural food store! Then my beautiful young friend Lindsay started talking about chai and how she makes it at home. She said she buys a chai concentrate made with real ginger and traditional spices that is UNSWEETENED!!!! I couldn’t believe my ears! We went over to the local Whole Foods and to my enormous delight they carry the very chai concentrate Lindsay was telling me about. It is called, “Bhakti Chai” and comes in a quart or larger size in the dairy section. I read the ingredients: organic fair trade black tea, organic fresh-pressed ginger, organic cardamom (love that stuff! ), black pepper, and other spices. That’s it! And it is non-GMO which is very good news. Here’s to the warmth of fresh ginger and cardamom in a delicious chai tea! I know some of you have much more expertise when it comes to tea than I have. Have you tried this tea? Did you like the amount of ginger in it? Do you make your own chai? This entry was posted in Food, Tea and tagged almond milk, ayurvedic tea, Bhakti Chai, cardamom, chai tea, chai without sugar, Coconut milk, ginger by mycookinglifebypatty. Bookmark the permalink. I say “venti tea w 2 chai tea bags, no water, all soy-steamed and no foam”. You have to pay attention or they hear chai latte or chai misto (half water and milk-yuck) so I make sure they get it! Also, when they hand you the cup check the foam level and if the cup feels light or half empty ask them to remove the foam and add more steamed soy “to the top”. This may seem like a lot of work but since I don’t drink coffee, it is my way of feeling like a “coffee shop adult”. You know the ones who order 2 shots of this with 6 pumps of that, steamed and shaken, etc.-yes, I am impressed as to how they figure this out to order so expressively. But back to the venti tea with chai tea, 2 bags, all soy, no foam. It is yummy and no sugar! This is the fun part-the payment! They haven’t added my “Chai Tatte” to the menu board yet so I say charge for a Venti tea plus soy or they charge for a Misto tea but it creates a chance to converse with the Barrista! I let it steep for @10 min then stick a straw in the sipping hole and enjoy. Wow Kate! You’ve got this thing all worked out. I’m impressed and thanks for the explicit instructions!